Canadian Daily Deals: Swagbucks Get $5 When You Sign Up For Swagbucks in January! 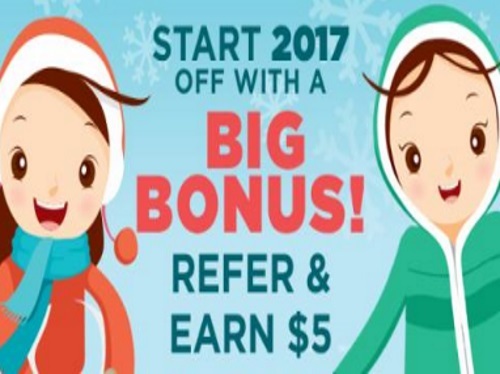 Swagbucks Get $5 When You Sign Up For Swagbucks in January! You've probably seen me write about Swagbucks a lot on here (I even post Swagcode updates on this post here). It's a site where you earn points (called SB) for things you're probably doing online already, like searching, watching videos, discovering deals, and taking surveys. Then you take those points and exchange them for gift cards to places like Amazon, Starbucks, Walmart, Target, or PayPal cash. 2. Earn 300 SB total before |February 2, 2017. You'll get a $3 (300 SB) bonus for it! That's it. It's super easy, and Swagbucks is for real. I use it myself, and I earn $100 Paypal every month doing this!